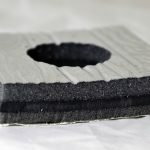 Bulb trim provides sealing and insulation for doors, hatches, and enclosures with rounded corners. These industrial rubber products have separate bulb and retainer sections, each of which can have a different durometer or hardness. The bulb forms a seal under low-to-medium closure force. The retainer or trim is pressed into place over a flange and may have an integral tongue or metal clips to promote attachment. Elasto Proxy supplies a wide variety of bulb trim seals and can custom-fabricate finished gaskets that save time and money on your assembly line. In this article, you’ll learn how to choose the right bulb trim for your application. Whether you work in engineering, procurement, or production, compound selection and part dimensions are critical. Product features vary, too. Do you need bulb trim that’s made from a specialty material, or can you use a commercial-grade rubber instead? Compounds that are commercial-grade usually cost less than specialty rubber. That’s because specialized compounds meet standards, approvals, or regulatory requirements that can be challenging to attain. 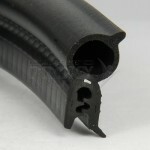 Specialty rubber usually has higher minimum order quantities (MOQs), too. Compound selection also means choosing an elastomer that can withstand the application’s environment. What is the temperature or range of temperatures? Is there exposure to wind, water, chemicals, or fire? It’s also important to choose a rubber that resists compression set. Otherwise, the bulb won’t “bounce back” to its original thickness after a compressive force (such as closed door) is removed. 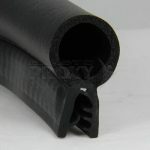 Typically, the bulb portion of a bulb trim is made of either EPDM rubber or a thermoplastic elastomer (TPE). EPDM provides excellent resistance to weather, ozone, aging, water, and steam. 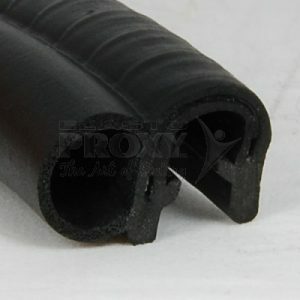 EPDM also remains flexible at low temperatures. TPEs are also weather-resistant, but these materials are recyclable and support extensive color-matching. TPEs are more expensive, however, so remember to consider the costs. 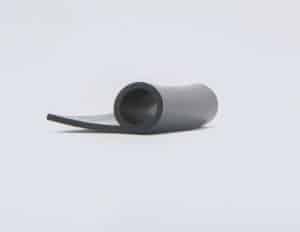 The retainer or trim portion of a bulb trim seal is often made of polyvinyl chloride (PVC), a polymer that maintains its flexibility at lower temperatures and resists kinking. PVC also offers excellent impact resistance and good abrasion resistance. PVC isn’t the only retainer material that’s available, but it’s a versatile choice that’s suitable for many applications. Most industrial rubber products are black, but bulb trim can support distinctive designs. That’s why Elasto Proxy offers profiles that come in colors such as white, off-white, beige, tan, and gray. 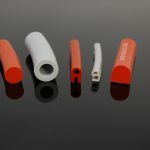 We can also source metallic-colored TPE profiles and supply bulb trim with specific textures. 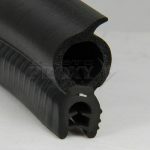 Many industrial rubber products are flat and smooth, but bulb trim with coarse, pebbly, or ribbed finishes are available. Some bulb trim features an integral tongue, but the retainer section of the seal can include a metal clip instead. This aluminum or steel clip promotes permanent gripping under demanding conditions such as the repeated opening and closing of a door, enclosure, or hatch. The retainer portion of the gasket may also support the use of a hot-melt adhesive for fastening. Finally, it’s important to choose bulb trim with the right bulb size, gap, and bend radius. To determine the bulb size, measure the distance between the door and the jam when the door is closed. Then add between 25% and 50% to account for compression. Do not add a larger amount. Over-compressing the bulb won’t create a better seal. In fact, it may reduce seal life and result in compression set. The gap or edge thickness for the retainer section also requires accuracy. As a rule, choose a bulb trim where the gap equals the flange. For example, choose a bulb trim seal with a gap of 1/2” for a flange that’s 1/2” wide. If you choose a bulb trim with a larger or smaller gap, the seal may leak. The wrong bend radius can limit sealing performance, too. If the angle in the bend radius is too large, recesses or valley may form and allow the passage of water. If the angle is too small, kinking may occur. Choosing the right bulb trim can help you to avoid these problems, but mistakes during installation can also limit gasket performance. 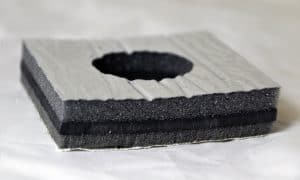 That’s why Elasto Proxy supplies custom-fabricated rubber products that arrive on your assembly line ready-to-install. Do you need bulb trim for doors, hatches, or enclosures with rounded corners? Elasto Proxy is ready to answer your questions about compound selection, product features, and part dimensions. We can also fabricate custom solutions that help you to reduce material waste, speed installation times, and improve overall quality. 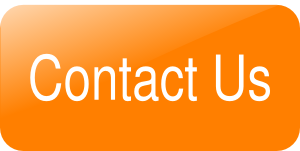 To get started, contact us.